General Qamar Javed Bajwa - Biography, Life, Military Career and More! General Qamar Javed Bajwa was born on 11th November 1960 in a small town of Ghakar Mandi of Gujranwala district in Pakistan. He is the holder of Nishan-e-Imtiaz along with Hilal-e-Imtiaz for his services to the country. He is a four-star rank army general and the current Chief of Army Staff of the Pakistan Army, appointed in this capacity since November 2016 after the completion of term by the former Chief of Army Staff General Raheel Shareef. General Bajwa was educated at the F. G. Sir Syed College, later attending the Gordon College. Bajwa started his military service in 1978 and was commissioned in 1980 in the Baloch Regiment. Prior to be appointed as the Chief of Army Staff of Pakistan Army, he served at the Army GHQ as the Inspector General of the Training and Evaluation from 2015–16 and as field commander of the X Corps from 2013 to 2015 which is responsible for the area along the Line of Control. In addition, he also served as a peacekeeper in the UN mission in Congo as a Brigadier and served as the brigade commander in 2007. General Bajwa has vast experience in the field, especially in crucial areas such as Baltistan and Kashmir. His approach towards Pakistan’s arch rivals and neighbors India remains passive yet firm which makes him a composed General ready to act with a clear mind rather than being impulsive. He has remained professional and away from politics throughout his term in the army which also adds to his qualities as a true military general. Bajwa was born on 11 November 1960 in Karachi to a Punjabi Jat family belongs from Ghakhar Mandi. His father was a Lieutenant Colonel in the Pakistani army. Lieutenant Colonel Muhammad Iqbal Bajwa died while in service in 1967 in Quetta, Balochistan. His mother died in September 2013. Bajwa’s father-in-law was also a Pakistan Army officer who retired as a Major General. General Qamar Bajwa is the youngest of five siblings. Bajwa completed his secondary and intermediate education from F. G. Sir Syed College and Gordon College in Rawalpindi before joining Pakistan Military Academy, Kakul in 62nd Long Course. Bajwa is a graduate of Canadian Army Command and Staff College in Canada, Naval Postgraduate School in United States and National Defense University, Pakistan. 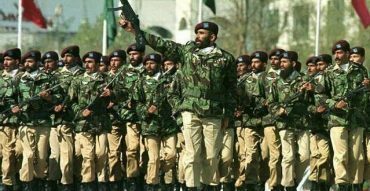 Pakistan Army is counted among the strongest armed forces of the world which has about 617,000 active troops and almost 500,000 reserves. This makes it the seventh largest army according to the active troops. Pakistan Army is the only army of any Islamic nation that has had female major general in the staff. Pakistan Army spends about $10,000 per its soldier. There is a notable amount of Non-Muslim soldiers who have however made till the rank of Brigadier which started in 1990 when a Christian named Julian Peter was promoted as Major General. Qamar Javed Bajwa was enrolled in the Pakistan Army in 1978 and was commissioned on 24 October 1980 in 16 Baloch Regiment. This was the same unit that his late father commanded in 1960s which helped his case since he had witnessed his father in action in the same region.He briefly served in 5th Northern Light Infantry Regiment in Kashmir in 1992 as major. As Lieutenant Colonel, he served in the X Corps which is stationed in Rawalpindi, where he was general staff officer. As a brigadier, Bajwa served as Chief of Staff at X Corps and has also commanded a division in Northern Areas as formation commander. Bajwa has also commanded a brigade in United Nations peacekeeping mission in Congo in 2007. He served in Congo as a brigade commander in 2007 under former Chief of Army Staff of the Indian Army Bikram Singh, who was serving there as a division commander. 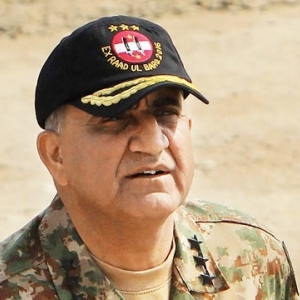 Gen Singh later termed Bajwa’s performance there as “professional and outstanding” and praised his work ethics throughout the term of his service under the Indian General. General Qamar Javed Bajwa was promoted to the rank of Major General in May 2009. As a Major General, Bajwa served as the Force Commander of Gilgit-Baltistan which happens to be one of the most difficult terrain to serve in. He held the title of the General Officer Commanding in that region. He was awarded Hilal-i-Imtiaz (Military) in August 2011. Bajwa was an instructor at School of Infantry and Tactics in Quetta, training army recruits at Command and Staff College in Quetta and at National Defense University, Pakistan. General Qamar Bajwa at that time was promoted to the rank of Lieutenant General in August 2013 and was installed as Corps Commander X Corps shortly afterwards his appointment. He was Grade-I officer during his tenure as Corps Commander X Corps. In 2014, General Bajwa (Lieutenant General of that time) was installed as Colonel Commandant of Baloch Regiment. In September 2015, he was appointed as the Inspector General of the Training and Evaluation at the GHQ where he was a Principal Staff Officer to then Chief of Army Staff Raheel Shareef. Because of General Bajwa’s posting at the X Corps three times which happens to be Pakistan army’s important and largest corps, Qamar Javed Bajwa gained good experience of handling affairs in Kashmir. Kashmir has been a disputed territory since the birth of Pakistan and any General appointed as the Chief must be well versed and experienced in the military affairs of that region. This helped his case in becoming the 16th Chief of Armed Staff. He belongs to the infantry’s 16 Baloch Regiment and 62nd Pakistan Military Academy Long Course. Dawn, an esteemed and well-read newspaper in Pakistan, reported that he lacks the experience of armed conflict because he has never been posted in a war zone area which could have affected his case since Pakistan Army has been operational in the field fighting terrorism and other enemies since the mind can recall. Nevertheless, Qamar Javed Bajwa has sound understanding of Indian strategic ambitions in the region and experience of armed conflict on Line of Control in Kashmir. In December 2016, he was awarded Nishan-e-Imtiaz which happens to be the highest honor that can be bestowed to a civilian by the Government of Pakistan for their services to the country. Before his appointment as the Chief of Army Staff, rumors surrounded the Ex-Chief that General Raheel Shareef might opt for an extension of his term in power. This rumor was put to rest by the General himself who stated that he will not take an extension of his term and the new General will be appointed for the Pakistan Army. In November 2016, Qamar Javed Bajwa was promoted to the rank of four stars General and was appointed as the 16th Chief of the Army Staff of the Pakistan Army by Prime Minister Nawaz Sharif, succeeding Raheel Shareef. It is believed that his pro-democracy track record and views played a key role in his appointment for the COAS slot. 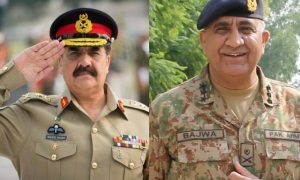 It has been rumored and reported that General Bajwa stays neutral in relation to the issue of India and he has considered religious extremism a more direct and important threat to the security and safety of Pakistan as compared to the threat from the border. 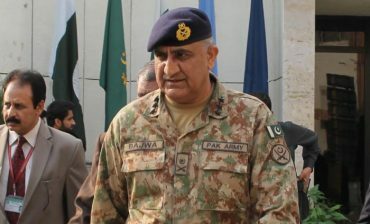 Reuters reported that he was selected as the General because of his low-profile personality which would help him stay away from national politics.The Guardian reported that Qamar Javed Bajwa was appointed as the Chief of the Army Staff despite a maligning campaign on social media sites that spread claims that relatives of Bajwa were members of the Ahmadiyya Muslim Community. This issue was crucial because Ahmadis are not considered Muslims by Pakistani law and therefore this speculation would damage his reputation since no non-Muslim can become the Chief of Army Staff of the Pakistani Army. 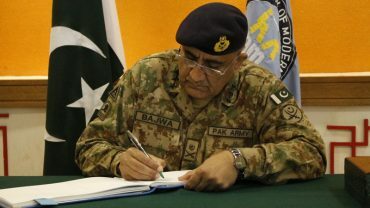 Having assumed the charge as the 16th Chief of Army Staff for the Pakistan Army, General Qamar Bajwa became the fourth oldest Army Chief of Pakistan at the age of 56 and a few days. Former General Raheel Shareef remains the oldest General to have taken charge with 57 years 5 months and 13 days. The second oldest chief was Mirza Aslam Baig who took charge at the age of 57 years and 15 days. The third oldest General was General Tikka Khan who became the Chief of Army Staff at the age of 56 years and seven months. In this regard, it is interesting to note that the youngest General of the Pakistan army was Muhammad Ayub Khan who became the chief at the age of only 40 years. General Qamar Javed Bajwa was commissioned in 16 Baloch Regiment on 24 October 1980. This regiment alone has produced three out of the sixteen army chiefs in the past – General Yahya, General Aslam Baig and General Ashfaq Pervez Kayani. He is graduate of Canadian Forces Command and Staff College, (Toronto) Canada, Naval Post Graduate University, Monteray ( California) USA and National Defense University, Islamabad. He has been an instructor at School of Infantry and Tactics, Quetta, Command and Staff College, Quetta and NDU. He has also been Brigade Major of an Infantry Brigade and Chief of Staff of Rawalpindi-based X Corps. He has also commanded Pakistan’s Contingent in Congo as part of the United Nations peace keeping service. He has commanded Rawalpindi Corps, and was presently serving Inspector General Training and Evaluation at GHQ. Former Indian Army chief, General Bikram Singh, praised General Qamar Javed Bajwa as a ‘true professional’. In 2014, Qamar Javed Bajwa, who was the then Corps Commander Rawalpindi, had said: “we have no threat from India, in fact we have threats from the extremist between us”. A few days before being appointed as the Chief of Army Staff, a politician Sajid Meer disclaimed that General Qamar Javed Bajwa and his relatives follow the Ahmadi religion which started a controversy leading towards serious objections for his promotion as the chief. Lately many people have been accused and persecuted in the country by religious scholars for following the Ahmadi sect. Ahmadis are also known as Qadiyaanis who are the believers of Mirza Ghulam Ahmed Qadiyaani. Constitution of Pakistan under the government of Zulfiqar Ali Bhutto, in 1974 declared Ahmadis as Non-Muslims for the first time in Pakistan which by far has not been changed in the constitution.